Store-bought cake mixes make entertaining and special occasions a breeze. They are cheap, easy to prepare and readily available. Unfortunately, they lose that special homemade quality that from-scratch cakes have. There are ways to make your run-of-the-mill cake mix taste more like a cake made from scratch, such as a touch of peanut butter. Move the oven rack to the middle level. Preheat the oven to 350 degrees. 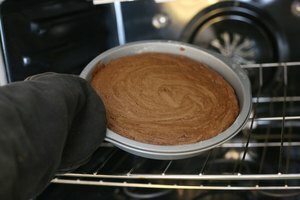 Use a cooking spray to grease 2 round, 9-inch cake pans and dust them with flour. Sprinkle the flour in, turn the pan to coat the bottom and sides, then dump the excess out. Use an electric mixer to mix 1 box of yellow cake mix, 1 1/3 cups of water, 1/3 cup of smooth peanut butter, 1/3 cup of vegetable oil, 3 large eggs and 1 tsp. of pure vanilla extract. Beat on low for 30 seconds. Use a rubber spatula to scrape the sides of the bowl. Turn the mixer to medium. Beat the mixture for 2 more minutes. Use your rubber spatula to scrape the sides of the bowl as needed. The batter should be smooth and fully integrated. Place one of the 9-inch cake pans on an electric kitchen scale. Zero out the scale and pour half of the batter into the pan. Take note of the weight. Do the same for the second pan. If you still have some batter left, put the first pan back on the scale, zero it out and proceed as before. Equal amounts of batter in each pan will ensure that the two cakes bake evenly and are the same size. Place both pans in the oven and bake for 23 to 28 minutes, or until the cakes are cooked through. You will know they are done when the tops of the cakes spring back when touched. Use oven mitts to take both pans out of the oven and place them on top of a wire cooling rack. Leave the pans for 10 minutes to allow them to cool. Loosen the cakes from the pans by running a butter knife along the edge of the cakes. Place a plate on top of each pan. Turn them upside down and allow the cakes to fall out of the pans. You are done with the pans now. Place the cooling rack on the cake and flip it upside down to get the cake upright again. 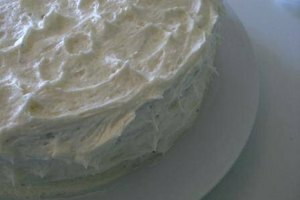 Allow the cakes to cool completely before icing. Place one layer of the cooled cake on a serving platter. Insert strips of wax paper under the edges of the cake layer. These strips will be removed when you are done icing and are used to catch any icing that may make a mess while icing. Spread a layer of chocolate icing on top of the layer you just placed on the platter. Smooth it around with a rubber spatula. Add the second layer on top. Spread icing over every exposed surface. Remove and discard the pieces of wax paper. 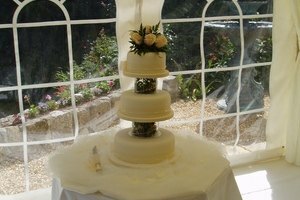 Keep the cake under a glass cover for up to three days at room temperature.